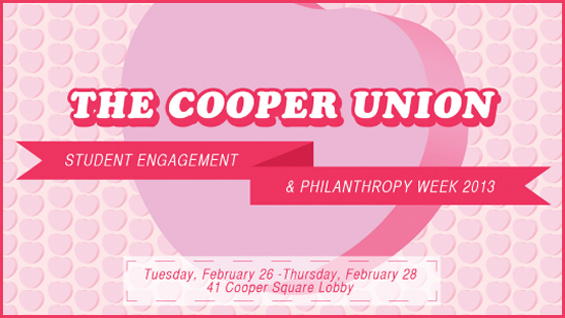 Cooper’s Student Philanthropy Committee has put together a three day event to reach their goal of 100% participation among the student body. Tuesday, Feb. 26 through Thursday, Feb 28, student volunteers will be at tables in the NAB lobby. From 12:00-4:00p.m., student can stop by the tables to learn more about philanthropy and to make donations to Cooper’s Annual Fund, Senior Class Gift and/or the JAC. The Origami Club will take part as well by offering their works at various suggested donation levels. An online auction site has also been created and can be seen at http://www.winorigami.com/?page_id=119. While all gifts at any level are welcome and will enter participants in a raffle for Cooper merchandise, we are also excited to announce that an alumna designed special edition t-shirt commemorating the event will be given to students who make a minimum dontaion of $15. The drive will end with a celebration on Thursday, Feb. 28, from 5-6:30p.m. in Frankie’s. At the celebration, the Student Philanthropy Committee will announce the results of their efforts, the t-shirt design will be revealed and t-shirts will be distributed, and the raffle prizes will be awarded. All students are invited to come by to be a part of the event and to enjoy a snack. To be a volunteer at the tables, sign yourself up for a shift or two. See here for more about the event.